Istanbul Religious Tours, Religion in istanbul, Islamic heritage tour in istanbul, Istanbul religious city tours, Sultanahmet Religion Tours, Walking religion Tours in istanbul, Christian Tours in istanbul, Jewish walking tours in istanbul, group religioustours in istanbul, private islamic tours in istanbul, hire a guide in istanbul for jewish tours, off the paths religious tour in istanbul, muslim islam excursions in istanbul, ottoman religious tour, byzantine christian religious tour in istanbul, sufism and muslim sightseeing tours in istanbul, islamic historical places in Turkey, islamic sites in Turkey, islamic religious tours, islamic heritage tours, mosques and tombs in istanbul, muslim community in istanbul, muslim mosques and tombs tours, visits mosques and tombs visits in istanbul, sahabetombs, religious places in istanbul islamic historical places in Turkey, islamic sites in Turkey, islamic religious tours, islamic heritage tours, mosques and tombs in istanbul, muslim community in istanbul, muslim mosques and tombs tours, visits mosques and tombs visits in istanbul, sahabetombs, religious places in istanbul. istanbul tour, istanbul turu, istanbul toer, جولة اسطنبول, Turneu istanbul, Стамбул туры, Истанбул турне, 伊斯坦布尔旅游, تور استانبول, daith Istanbul, Oficina de Istambul, istanbul vwayaj, istanbul turneju, טיול באיסטנבול, turas Iostanbúl, Tour de Estambul, Istanbúl ferð, イスタンブールツアー, Tour d'Istanbul, 이스탄불 투어, istanbul túra, Истанбул турнеја, Posto de Istambul, Стамбул туры, Истанбул турнеје, Стамбул тури. Welcome to Istanbul - Our company is recommended in Lonely Planet guide book & Trusted since 2000. Istanbul Religious Tours are the spiritual activities that you can do in Istanbul and you can learn the culture & religions in our city. Istanbul is the center of religion for centuries. 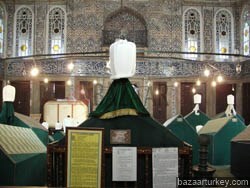 We will visit the holy 27 sahaba tombs located in istanbul area. Suleymeniye Mosque - Eyup Sultan Mosque - Sahabe Tombs - Old Istanbul city walls. Religious visits, prayers duas. This is a religious ziyarat and tours for muslim families and individuals that are visiting istanbul for holiday or Umrah. Istanbul has 95% of the population is Muslim and the city has an astonishing number of nearly 3000 mosques. Suleymeniye Mosque - Eyup Sultan Mosque and visiting other important mosques of istanbul and learn the stories. Full Day Tour - Lunch Included..
Our Tours are starting from istanbul. We make our tours by plane bcs it is easier to reach the train station located outside of istanbul. The ritual of the Mevlevi sect, known as the sema, is a religious ritual performed by Muslim priests in a prayer trance to Allah. General Information about Sufism - Whirling Dervish Ceremony - Live Sufi Music..
Do you have questions about Sufism, Islam, rituals and traditions in Turkey ? Visit us and we can answer your questions. General Information about Sufism - Whirling Dervishes and Sufi Life.- Lecture from a real Sufi man.